Being part of the busy world of today doesn’t leave much time for hanging out with nature unless we take matters into our hands and make sure it becomes part of our day to day lives. This is easily achieved when you buy a campervan, of course maybe not every day, but you won’t have the excuse anymore not to embark on a journey and stay in touch with nature whenever you get the chance. However, same as every other vehicle, it requires regular check-ups and maintenance, sometimes to a degree more than your car for instance, because usually it doesn’t fit everyone’s garage so it’s parked outside. The first step to ensure its optimal condition is to protect it from the weather. There’s nothing that damages colour quite as much as rain and hail, but parking by trees isn’t that good of an option either because of the leaves, sap and insects (not to mention birds using your caravan as a toilet). Then again, parking outside also means it’s more susceptible to scratches, including sunlight fading of your furnishings, which is nothing campervan covers can’t handle. If you still aren’t sure about purchasing a cover, just think of how it can save your caravan from repairs and replacements, guarding it fully against dirt and corrosion. Campervan covers of today are designed to allow air circulation, perfect breathability, and not retain moisture. 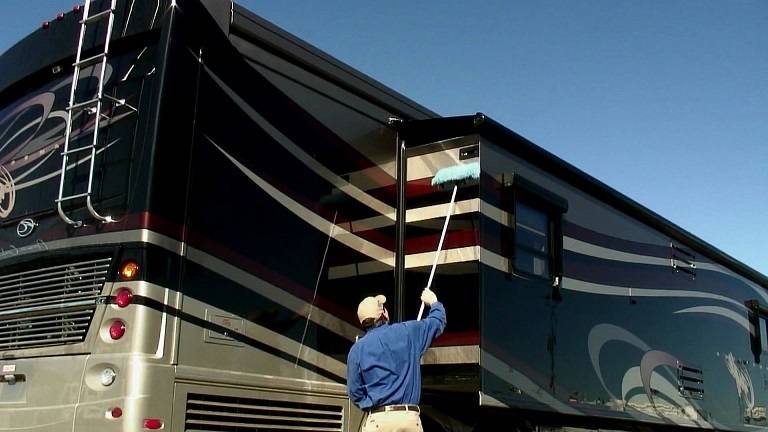 As it’s spring, it calls for doing some springtime cleaning before you take your caravan to the road. Even if your caravan is well-protected for extended period, you still have to do frequent check-ups. In fact, this should become your habit that you have to repeat every time before and after a trip and do some cleaning inside and out. This way you prevent bacteria from spreading, making sure the fridge is emptied out, the inside vacuumed, leaving everything spotless, and the outside polished. This also includes sterilising the water system before you use the caravan. The same goes for the electrics – basic check-ups are a must if you don’t want to end up going out of light once on the road or have appliances out of order. Another priority is ensuring the brakes are functioning perfectly, applying a lubricant if necessary, and of course charging the battery and giving a look at the tyres, to see whether they’re worn out or have any cracks. It’s important, in case you notice something out of the ordinary and in need of repairing, to seek the help of professionals immediately before it turns into a bigger, and more expensive, damage.